Kyra Fox is a researcher assistant at the Simon-Skjodt Center for the Prevention of Genocide at the US Holocaust Memorial Museum, where she conducts research on strategies to prevent and mitigate contemporary mass atrocities. She has conducted fieldwork in Northern Uganda and the Netherlands and previously worked for the Center for Social Integrity, a Rohingya-led civil society organization based in Cox's Bazar, Bangladesh. 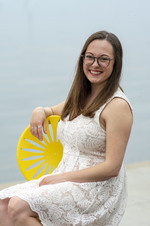 She graduated from the University of Wisconsin-Madison in May of 2018 with a B.A. in International Studies and Psychology and a minor in African Studies. During her undergraduate, she conducted research on the complex victim/perpetrator status of former child soldiers in the Lord's Resistance Army and drivers of youth participation in mass atrocities in Northern Uganda, Myanmar, and Sierra Leone. Kyra served as the communications and outreach specialist at the University of Wisconsin-Madison African Studies Program, where she reimagined the program's communications strategy to reach an increasingly diverse audience of government partners, students, and community members. Kyra led interfaith dialogue in the Madison area as an Interfaith Fellow with the Center for Religion and Global Citizenry. She mobilized 130 local interfaith leaders into an online platform, directed interfaith leadership workshops, spoke on panels of religious studies professors, and successfully advocated against religiously discriminatory university policies.